Simon & Schuster, 9781501125751, 400pp. From New York Times bestselling author Christopher Buckley, “one of the funniest writers in the English language” (Tom Wolfe), a compelling and hilarious adventure featuring a sixteenth-century relic hunter and his best friend, Albrecht Dürer, who conspire to forge the Shroud of Turin. "We may be in 1517, but this is still a political send-up, and it’s as rascally and convivial as any that Mr. Buckley has written." "Beguiling, funny, and slyly erudite." "Impossible to put down once you’re caught in its thrall. But it’s not just the book’s page-turning pace that makes it so compelling; it’s Buckley’s stunning gift for unsparing satire. . . . The genius of Buckley’s satire is not merely its acuity but its balance." "Might be pitched Hollywood-style as The Princess Bride meets Ocean's XIII." "A madcap heist adventure...that’s as comical as any in Buckley’s modern era tales. Buckley’s many fans will be pleased." "This historical novel is part Monty Python and part Ocean's 11. The clever narrative is filled with laugh-out-loud one-liners but, amazingly, doesn't stint on the suspense.... Through the cheeky humor, the author gives readers a very real sense of the early 16th century, when science and superstition held equal sway, and a man was always a swordsbreadth away from a horrible death." "An exciting novel that proves that, in the world of political intrigue, some things are timeless." "Arch humor, intricate twists and delightful surprises . . . Buckley has a talent for comic timing and the ability to make even morally ambiguous characters endearing." “On one level, the novel entertains with a thrilling cast of characters, violence, vulgarity and a great deal of comedy…. On another level, the novel is a wonderful satire of our current politics, economic system, our greed for things once possessed by celebrity and the way in which we value art…. I recommend that you pick up Buckley’s novel. Relic Master entertains." “Ever wish Monty Python had written a novel? If so, The Relic Master is here. 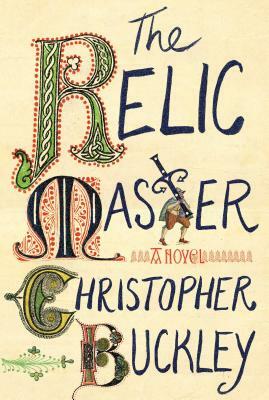 With laugh out loud humor, witty dialogue, and a true sense of historical detail, author Christopher Buckley has created a work of farcical art in this fast-paced adventure….The story leaps off the pages like the brilliantly, beautifully, and naughtily illuminated Bible pages carefully done by the monks of yore."